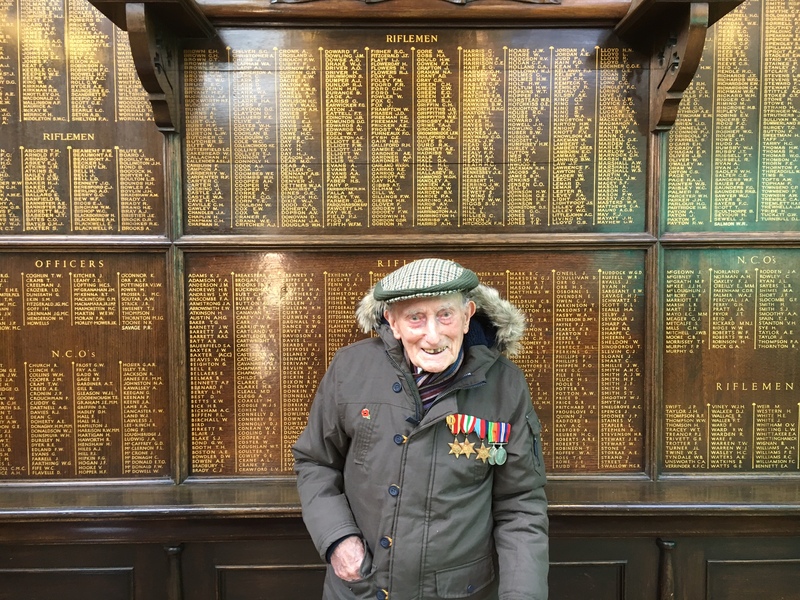 At the recent Remembrance Sunday parade at Connaught House, we were absolutely honoured to meet with veteran Alfred Cook, who served with the 1st Battalion, London Irish Rifles (1 LIR) during the Second World War. 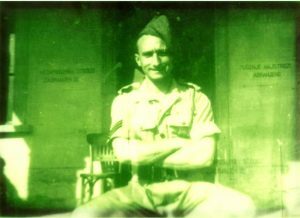 Alfred had travelled with the battalion when they left Liverpool in August 1942 and remembered visiting South Africa and India before arriving in Iraq in November. After spending a rather dispiriting six months in the north of the country near Kirkuk, the battalion would travel back to Egypt in April 1943. Over the next two years, Alfred would be in the front line with 1 LIR, as they fought their way north through Sicily, during the battles at Monte Camino, Castelforte and Anzio before taking part in the desperate fighting on the Gothic Line in September 1944 and the final advance towards victory in Northern Italy during April 1945. By the end of his war, Alfred had been promoted to Sergeant and would spend the immediate post conflict period with the London Irish Rifles in the Trieste area before eventually being de-mobbed back to civvy street. Alfred clearly remembers a number of events during his Army career – including the wonderful hospitality shown by the residents of Cape Town, where they stayed for a few weeks on route for Iraq. A particularly vivid memory was being present when the former Commanding Officer of the Regiment, Colonel Macnamara, was killed when he was visiting 1 LIR in December 1944. Alfred recalls “only being a few yards away” when the German artillery stonk came into the battalion’s lines. Now 97 years of age, Alfred lives in nearby Stockwell with his grandson Dean and partner Amanda, and displays a remarkable resilience and vitality, possibly stemming from his East London upbringing and his working period as a Docker. Alfred was married to Ann for 75 years before his wife died earlier in 2016.